Independent Creative Sound and Music (ICSM) Records will release a new CD on 1 March 2019. 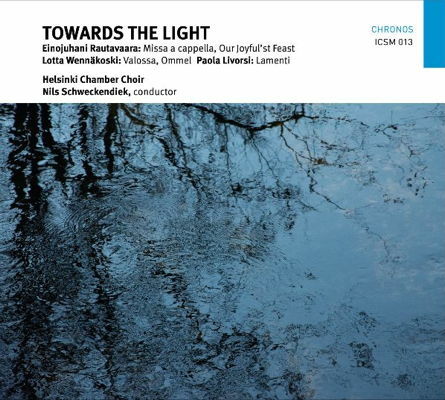 Towards the Light is a single full-price CD (ICSM013, bar code 5060399880176) features the Helsinki Chamber Choir conducted by Nils Schweckendiek, singing music by Rautavaara, Wennäkoski and Livorsi. Born in Helsinki, Finland - between east and west - Einojuhani Rautavaara (1928-2016) was the son of Eino Rautavaara, an opera singer and cantor at the local Kallio church. His mother Elsa ran a local medical practice. Rautavaara lost both his parents before adulthood and fondly reminisced about all the times he spent in the organ loft, waiting for his father to ﬁnish work. Like most Finns, while Einojuhani Rautavaara was a Lutheran Protestant, he was neither particularly devout nor religious. His credo was a primarily musical one, and while it was deeply rooted in the Western Catholic and Lutheran canons, as the years passed, he developed a strong aﬃnity with the spirituality and mystical nature of the Eastern Orthodox church. Rautavaara began work on an unaccompanied mass, the Missa a cappella, in March 2009. Rautavaara ﬁrst considered composing a Catholic Mass in the early 1970s while working on the single-movement Credo (1972) for choir. A full ordinary mass seemed a natural outcome, as Rautavaara had already composed an Orthodox Vigil in 1971. Missa a cappella was ﬁrst performed on 25 November 2011 at Jacobikerk, Utrecht, by the Netherlands Radio Choir under Celso Antunes. Our Joyful'st Feast came into being only a few years earlier when the Helsinki Chamber Choir and Nils Schweckendiek commissioned a choral work to be performed at the European Broadcasting Union Christmas concert. Rautavaara decided to set texts by two English Renaissance poets: two extracts from Shakespeare and a section from an extensive Christmas poem by George Wither, a contemporary of the Bard. As the composer puts it, these texts 'have a robust Renaissance joyfulness which I feel suits a European Christmas, even ﬁve hundred years later'. This is reﬂected in the music, as Our Joyful'st Feast keeps uplifting our spirits with its sonorous ascending sequences, eventually covering the full vocal range of the mixed choir. Word play, the compositional potential inherent in the different meanings of words, sounds made possible by their respective vowels and consonants, their rhythm, context and content, are all afforded fresh examination in Ommel by Finnish composer Lotta Wennäkoski (born 1970). Born in Helsinki, Wennäkoski studied composition at the Sibelius Academy and the Hague Royal Conservatory. At an early point in her studies she also a spent a year in Budapest, Hungary, studying violin, music theory and Hungarian folk music. Wennäkoski has garnered a respected position in Finnish musical life and has been a full-time composer for many years. Having twice been nominated for the Nordic Council Music Prize, her music has also been performed at the Märzmusik Berlin, Warsaw Autumn and Huddersﬁeld festivals. Recent success includes a commission by the Scottish Chamber Orchestra -'Verdigris', premiered 2015), a new orchestral work, 'Flounce', for the BBC's 2017 Last Night of the Proms, and the CD release 'Soie', featuring a collection of Wennäkoski's orchestral works performed by the Finnish Radio Symphony Orchestra. Lotta Wennäkoski is known for her often playful and lyrical compositions, and Ommel is no exception. Commissioned by the Helsinki Chamber Choir, the work is based on a simple premise: the same tanka poem by Abe no Iratsume, the eighth century Japanese poet, is set in ﬁve different languages. It is interesting that, though the work's title is in Finnish, Wennäkoski did not select her own language as one of the translations in Ommel. The short work Valossa does ﬁnally offer a taste of Finnish. The title means 'In the light', and the text is based on several fragments taken from the Bible. From these fragments Wennäkoski has patched together a semi-narrative whole, circling towards its conclusion on words from Ephesians 5:14: 'for anything that becomes visible is light'. Both works, Ommel and Valossa were first performed by the Helsinki Chamber Choir and Nils Schweckendiek on 5 April 2014. An entirely different mood resonates throughout Lamenti by Italian composer Paola Livorsi (born 1967). The title refers to the lamenting, ever-falling musical lines of the 'lamento', which in the madrigals and arias of the Renaissance and Baroque expresses an often-uncontrolled mourning over the passing of a loved one. After studying music history and composition in Turin, Paola Livorsi ﬁrst went to Helsinki in 1997 in order to study composition and electronic music with Kaija Saariaho and Jean-Baptiste Barrière. After continuing her studies 1999-2001 with Saariaho in Paris, where she attended classes in electro-acoustic music at CCMIX and IRCAM, Livorsi eventually settled in Finland. She has recently been working on multidisciplinary collaborations and on a doctoral project exploring the timbral aspects of human and instrumental voice. Lamenti was commissioned by the Helsinki Chamber Choir and was ﬁrst performed in 2012 under James Wood. The Helsinki Chamber Choir (Helsingin kamarikuoro) was founded in 1962 as the Finnish Radio Chamber Choir and assumed its current name in 2005. Currently Finland's only professional chamber choir, its wide-ranging repertoire includes music from the Renaissance to the present day and it is particularly highly regarded for its work with new music. The choir appears frequently at festivals in Finland and abroad, and collaborates with symphony orchestras, period instrument ensembles and contemporary music groups. Its concerts are regularly broadcast on national radio and television, and it has also appeared in productions for the ARTE channel and the European Broadcasting Union. Recent touring has taken the Helsinki Chamber Choir to the United States, Belgium, Russia and around Scandinavia. Nils Schweckendiek studied music at Clare College, Cambridge, UK, and orchestral and choral conducting in Freiburg and Helsinki. Since making his highly successful debut at the Finnish National Opera with Richard Strauss' Der Rosenkavalier in 2006, he has performed with orchestras, ensembles and choirs in many European countries, the United States and China, and appeared at numerous opera houses and festivals, including the Leipzig Opera and Savonlinna Opera Festival. Founded in 2014 and based in London, Independent Creative Sound and Music (ICSM) Records is run by musicians for musicians and is committed to uncompromising quality in every aspect of the recording, creating artistic statements beyond time and fashion. ICSM believe that artists should have full control over all aspects of the production, and at the same time fully respects artistic integrity and intellectual property rights. The label aims to give artists creative freedom and flexibility in the choice of repertoire they record.